As a Schilke Performing Artist, Bill plays in Gaudete Brass, a chamber group committed to the enhancement of the brass quintet genre through the commissioning of new works and music education. Gaudete Brass joined the Cedille Records catalog in 2012 and released their debut album “Chicago Moves”. 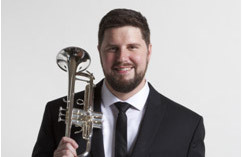 He is also the 2nd trumpet in the West Michigan Symphony under the direction of Scott Speck, and is an Artist Faculty at Roosevelt University. Bill teaches at Music Institute of Chicago and has lead masterclasses at some of the most esteemed music establishments in the United States including Juilliard School of Music, Eastman School of Music, Cal Arts, and the University of Michigan.